During a special Q&A session held on Facebook, an Olympic Gold Medalist offered his thoughts on the recent actions and comments made by "Rowdy" Ronda Rousey. What did the WWE Hall of Famer have to say in regards to his WrestleMania 34 tag team partner? Ronda Rousey posted a video on her YouTube channel, where she went off on a tirade about the WWE. This can be taken as a direct shoot, or quite possibly a worked-shoot, depending on your viewpoint. 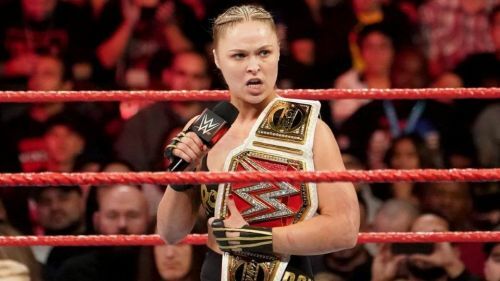 Rousey turned heel this past Monday night on RAW, after becoming fed up with the WWE Universe and the shenanigans surrounding her situation with Becky Lynch, Charlotte Flair and the McMahon Family. Former RAW General Manager and WWE Hall of Famer, Kurt Angle hosted a special Facebook Q&A session with the WWE Universe, where he answered various questions. One of which Kurt was asked on his thoughts to Ronda Rousey's heel turn and her remarks about the WWE in general. Ronda Rousey will likely be involved in some capacity for the Becky Lynch and Charlotte Flair match tonight at Fastlane. She is currently set to defend her RAW Women's Championship against Charlotte Flair at WrestleMania 35 on April 7th. What do you think of Ronda Rousey's recent heel turn? Let us know in the comments below. As always continue to support Sportskeeda for all your wrestling needs. Follow us tonight as we cover WWE Fastlane with all the breaking news stories and results!